Here’s Father Christmas, made in 2010, who has just come out for his annual airing on our living room wall, above the fire. (Inspired by a wonderful oil painting by artist Dean Morrissey from the US.) The bobble on the hat is made from shells, but here appears too white for the shadowed corner of the image. I don’t usually add any colour to the materials I use but this has proved the exception – since this photo was taken I have dampened down the bright whiteness with a used tea bag – a great improvement. Wishing you all a very happy Christmas time! 59 Responses to Happy Christmas! 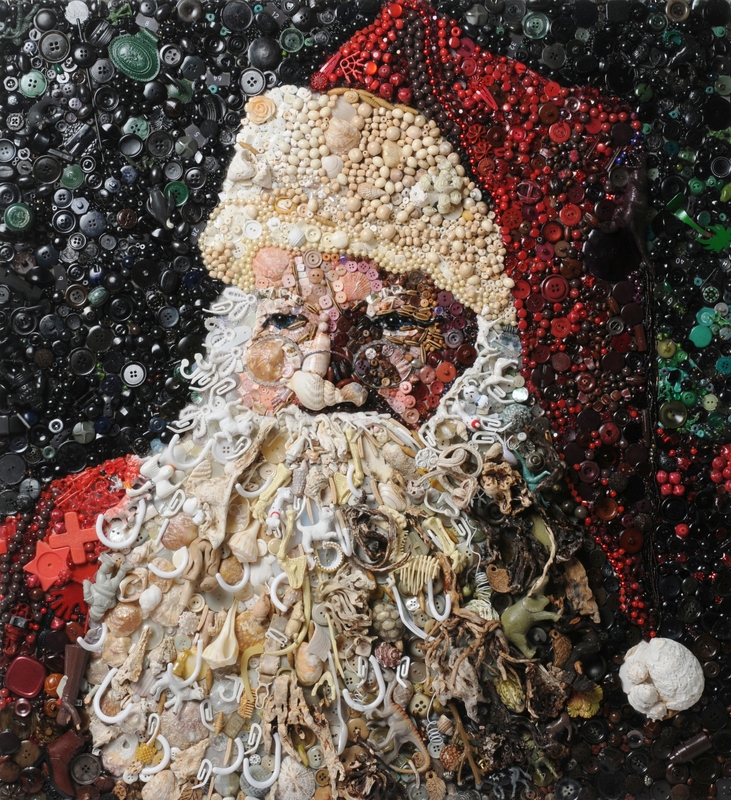 Sharing a beautiful piece of eco-art for holiday wishes. Do you sell a print of Santa Claus? Jane, for the past two years I’ve shared this AMAZING image to my facebook page, Beaches of Brunswick County (with credit to you). Hands down, it has been the favorite holiday image I’ve ever shared. It is a remarkable work! Julie, what is your website? I would like to order some cards. Thank you. I love this so much! Please could you tell me the dimensions of this piece? I’m having a hard time figuring out the scale. I see that you said you don’t have anymore note cards. Do you have anymore prints of the Santa picture? I love your santa. I just saw it today for the first time (on Facebook) I hope it was ok, I shared it to a mosaic site i am a part of. You should join! It’s called mosaic mentoring. By the way, everyone on there really loves it!!! Thank you – very happy you shared it! It’s a amazing job! Merry Christimas 2015! Is there any way we can purchase this Santa? I’m very sorry but I’m keeping this one for my family! One of the most incredible pieces I’ve ever seen. Your blending talent is unreal. Well done and so happy you kept it in your family. It’s a masterpiece! Looking for your fabulous Santa, & cards. I love Father Christmas. I have less than ZERO artistic ability so my question is actually about your technique and decision-making in this beautiful piece. What I lack in artistic ability, I excel at in OCD😂😂😂. Why is there not more space above Father Christmas’sf hat and where is the rest of his beard😱😳😱😳😱😳😱 What or how did you decide to not do a full beard? It’s quite usual/fashionable to slightly crop a portrait, or even crop it more than I have, but I do understand how that might have made you feel uncomfortable! Such a fabulous work of art – it comes around of Facebook every year, and I love it! This is Beautiful! What did you use to glue the pieces down? I’ve done a few of the button/bottletop pieces with my students. I just saw this December 2017 and loved this picture from the moment I saw it on facebook. Have you reconsidered and produced this as a print? if not do you still have cards available? I am madly in love with this. I am in awe of your stunning Santa piece. I am a hoarder of all things small and shiny – from buttons to sea glass. This is very inspirational. Thank you for sharing your amazing talent with the rest of us. Merry Christmas to you and yours. So happy you like the Father Christmas. I made him 4 years ago now but he seems to do the rounds on social media every Christmas! I love your Father Christmas piece and was very happy to be able to buy some of the cards. If you should ever decide to produce a print of him (as I, along with a bunch of others, sincerely hope you do!) I would purchase it in a heartbeat! Merry Christmas! Oh my gosh, this is FABULOUS!!!! I want it! Ha, I know it’s not for sale but I want it! Simply Amazing!!! Thank you for those kind words Cat!! Jane, every year I post your wonderful Father Christmas on my facebook page http://www.facebook.com/brunswickbeaches and it gets thousands of likes and shares. It is so very beautiful! That is very beautiful work! How long did that take you? How do I buy the cards? Thanks Beth! Call me old fashioned but I don’t do any social media stuff – just the Blog on my website! Please really consider to make the print. I would need 6 prints. I would also love a print should you decide to make some. Astonishing work. Brilliant!!! Thanks Maureen. It would be helpful to know what size print people would like??? Santa is Magical! Do you give lessons? I can not even describe how much I LOVE your Father Christmas. I have NEVER seen anything like it & I sooo admire your talents & abilities. I would love to have both a number of prints & cards when they become available. Please contact contact me at drlavern@gmail.com or text/call me at 585.507.2181. Hi LaVern – thank you so much for your kind words but he won’t ever be sold! I’ll put info on my website Blog in the New Year about cards and prints. Happy Christmas! I recently saw this for the first time. I love it! Please contact me at to how I can order the cards and let me know when I can purchase them. Wow! I just saw a post of your Old World Santa this Christmas morning. He is beautiful and touches my heart as this is something may mother would have loved. She collected anything Santa. Such a talent you have for capturing the variations in color and using plastic pieces to capture the layers of texture for each subject. I see in the string of comments above that maybe next year you will again have cards. More than anything I would love a print. I am now following your blog will be patient as they new year rolls along. All of your work is amazing. Do you only do commissioned pieces or do you sell to the general public. Thanks so much Samantha. I do make works for galleries and exhibitions as well as commissions. However, as it takes quite a while to make a piece, I can only produce a certain amount of work and have to make choices. A nice position to be in ! I concur with all others. I love this Father Christmas! Please put me on the list as well! PS This would also make a great jigsaw puzzle! Merry Christmas! !